CipherLab RK25 combines touch screen and numeric keypad as a one-handed terminal for all Android ordering applications. The rugged design, reliability and ease of use make this an outstanding device which will benefit a large number of convenient store users. CipherLab USA, a global leader in the design, manufacture, and marketing of Automatic Identification and Data Capture/Collection products and systems, will showcase its latest line of rugged mobile computers and barcode scanners at the NACS SHOW 2018 from October 8-10. The exhibition is held at Las Vegas Convention Center. All the NACS SHOW 2018 attendees can visit the booth #6453 at Central Hall. CipherLab will introduce new rugged RK25 Series Touch Mobile Computer that designed to address the demand in convenient store and fuel retailing operations. CipherLab RK25 is equipped with numeric keypads to fulfill diverse user behaviors, especially for those who are used to non-visual data entry operation, working in rugged outdoor conditions, and need custom configured buttons. Evolving from smartphones, its 4” display with multi-touch panel also ensures readability to further accomplish its friendly operation design. 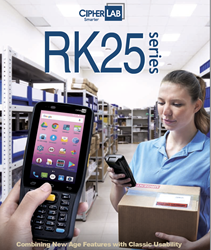 Built for data intensive environments, the RK25 is crafted with up-to-date features of the latest quad-core 1.4 GHz processor and IEEE 802.11 a/b/g/n/ac dual band communication to allow users to simplify complicated job processes. On top of that, the RK25’s industrial ruggedness and comprehensive offering in accessories and software empower users to thrive in their daily tasks.